In a microwave safe bowl, mix oats and water. Microwave for 2 minutes, or until oats are fully cooked and fluffy. Stir and let oatmeal stand for 1 minute. 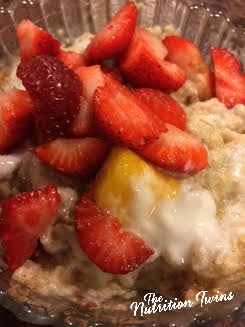 Mix in yogurt and cinnamon; then, mango and strawberries. Enjoy!